Independence of Macedonia ... with the disintegration of Yugoslavia in the early 1990's, the Republic of Macedonia saw its chance to finally achieve its independence. A referendum was held on September 8, 1991 with an overwhelming majority choosing independence. Recognition came swiftly from Russia, Bulgaria, Croatia, Slovenia among others but the majority of the international community stalled because of pressure from Greece. 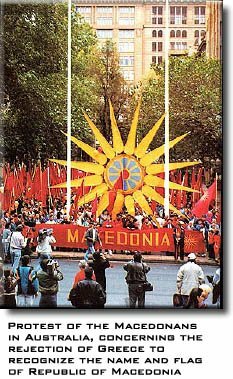 This country, as a member of the United Nations, European Union, and NATO blocked recognition of Macedonia because it claims that the Macedonian name and flag, claiming that the sixteen-pointed sun dating back to Ancient Macedonian Dynasty, belongs to Greece. And not only that the Greeks still today claim that there is some "Greek province of Macedonia" in their country. 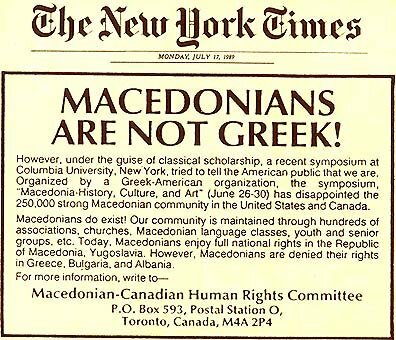 Unfortunately, dear Greeks and all other people should know that territory what the Greeks call Macedonia is Macedonian land occupied by them in the Balkan Wars in 1912-1913, and it is called Aegean Macedonia and by this day there still live around 1,000,000 Macedonians (including Greeks of Macedonian parents). Regardless, Macedonia was accepted as a full member-state in the United Nations, albeit with the awkward reference, Republic of Macedonia. However, the majority of countries and international organizations refer to this country under its constitutional name, Republic of Macedonia. Greek propaganda is slowly losing its influence, so as always the truth will come out. As a result of international pressure, the republic’s assembly amended the constitution to state that it had no territorial aspirations in Greece or any other country. Negotiations with Greece on the issue of a name collapsed, however, and the other members of the European Community (now the EU) sided with Greece by not acknowledging the republic pending further constitutional reforms. With negotiations at a standstill, and under pressure from the EU, the two countries in early 1993 turned to the UN for a resolution of the problem. In the meantime, unable to join international financial institutions or procure critical foreign loans and investments (because of its lack of recognition), and with its trade outlet blockaded by Greece, the republic soon found its already weak economy deteriorating. The blockade led to all fuel stocks being exhausted by September 1992, forcing most companies to suspend production. The republic’s own obedience to UN sanctions against Serbia and Montenegro meant the loss of two key trade partners. The republic’s lack of recognition also allowed Serbia to assert political and military pressure. Internal political and ethnic tensions flared in the period before recognition. 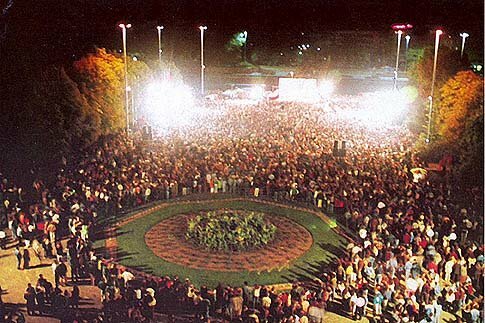 celebrated in Skopje, square Macedonia"
The republic’s Albanian minority increased the intensity of its lobbying for more recognition, with half the community demanding more political representation, and the other half boycotting all participation. Riots broke out in the capital, Skopje, during the autumn of 1992. The influx of some 50,000 refugees from the war in Bosnia and Herzegovina created another source of problems for the republic. 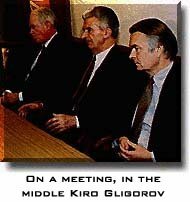 Following the collapse of the republic’s government in the summer of 1992, President Kiro Gligorov, the former Communist Party leader who was elected in January 1991, appointed Branko Crvenkovski as prime minister and gave him the mandate to create a new government. Crvenkovski helped form a coalition government, consisting of the Party for Democratic Prosperity, representing ethnic Albanians, the Liberal Party, and the Social Democratic Alliance. On April 8, 1993, the republic finally achieved full international recognition when it was admitted to the UN as the Former Yugoslav Republic of Macedonia. The name was a mutually acceptable compromise until a final settlement with Greece over its name could be attained. The issue of the flag was also to be settled through talks. As a result of UN membership the republic was also able to join the International Monetary Fund and gained observer status in the Conference on Security and Cooperation in Europe (now the Organization for Security and Cooperation in Europe, or OSCE); Republic of Macedonia became a full OSCE member in October 1995. In the first half of 1993 the UN sent 1,000 peacekeeping troops to the republic in order to prevent the war in Bosnia from spreading there. During 1993 some progress was made in the negotiations with Greece. However, the return of Andreas Papandreou as Greek prime minister in October 1993 was followed by an abrupt termination of talks, and a reimposition of a trade embargo and blockade in February 1994. The renewed embargo came just after the United States formally recognized the independence of the Republic of Macedonia (most western European states and Japan had recognized the republic by the end of 1993). Despite resistance from member countries of the European Union, in June the European Court of Justice ruled that Greece was at liberty to continue its embargo. In the autumn of 1994 another coalition government was elected to power, consisting of the ruling Social Democratic Alliance, the Socialist Party of Macedonia, and the Alliance of Reform Forces of Macedonia-Liberal Party. The coalition won 95 Assembly seats. The Republic of Macedonia nationalist Internal Macedonian Revolutionary Organization, the main opposition party and formerly the largest single party in the National Assembly, failed to win any seats after it boycotted the second round of the elections. Along with the Democratic Party of Macedonia, the opposition party claimed that the first round of elections had been fraudulent. In the same election, Gligorov was re-elected as president with 52.4 per cent of the vote. In November 1994 the United States signed a military agreement with the Republic of Macedonia, and had contingency plans to send up to 1,500 more US troops there. Tensions between the ethnic Albanian minority and the government continued in the republic, symbolized by a parliamentary boycott by Albanian deputies, and the violent struggle to create an Albanian-language university in Tetovo. The university was formally established in a ceremony in mid-February 1995 at Mala Recica, a village some 40 km (25 mi) west of Skopje. Clashes between ethnic Albanian supporters of the university reportedly left 1 person dead and 15 injured. During the same month, the 18 Albanian deputies in the National Assembly walked out in protest over a draft law forbidding the use of the Albanian language in the Republic of Macedonia identity cards and passports; they did not return until July. In September Foreign Minister Stevo Crvenkovski and his Greek counterpart, Karolos Papoulias, signed an accord brokered by UN mediator Cyrus Vance providing for mutual respect of sovereignty, territorial integrity, and political independence. The following month the National Assembly approved a new flag, replacing the controversial Vergina symbol with one of a sun. The accord led to the raising of the trade embargo by Greece and to a general easing of relations between the two countries during 1996. The outbreak of violence in Albania at the beginning of 1997, following the collapse of pyramid-selling schemes, provided Republic of Macedonia and Greece with a mutual cause for concern, and in March Foreign Minister Theodorus Pangalos became the first Greek Cabinet minister to visit the republic since 1991, when he arrived in Skopje to urge cooperation on containing the Albanian crisis. Continued concern about internal stability with regard to its own Albanian minority and tensions on the border with the Serbian province of Kosovo led the government to request the continued presence of the UN peacekeeping force. The UN Security Council agreed to six-month extensions of the mandate of the UN Preventative Deployment Force (UNPREDEP) in November 1995 and in May and November 1996. Another extension in May 1997 also included a provision for the start of a phased withdrawal beginning in October. In June, during an official visit to the United States, Gligorov made a personal plea to President Bill Clinton for the continued presence of the UN forces; US troops make up almost half of UNPREDEP’s 1,000-strong contingent. In June and July 1997 there was unrest after the government ordered the removal of Albanian flags from public buildings in Albanian-dominated towns. By early 1998 the Republic of Macedonia was making contingency plans for the evacuation of ethnic Albanians in the neighboring Kosovo region of Serbia if the fighting there escalated. And in the year of 1999 on 24th of March started the Kosovo war, which made a terrible shock for the Macedonian people.